BUFFALO -- Antonio Carr, 25, of Niagara Falls, NY, who was convicted of being a felon-in-possession of a firearm, was sentenced to 24 months in prison by U.S. District Judge Richard J. Arcara. Assistant U.S. Attorney Michael J. Adler, who handled the case, stated that on July 28, 2017, Niagara County Probation Officers performed a home visit for a woman living at 1224 Niagara Avenue, Upper Apartment, in Niagara Falls. As they entered the residence, officers observed the defendant, the probationer's boyfriend, in the bedroom of the apartment. Carr attempted to leave the apartment, telling officers he needed to go and get his children who were in the lower apartment. An officer accompanied the defendant, who was holding a blue jacket in his hand, to the lower apartment. Carr knocked on the door and handed the blue jacket to the occupant of the lower apartment. The officer witnessed the occupant of the lower apartment take the blue jacket down a hallway and place it on a staircase. When the officer asked the occupant of the lower apartment for the blue jacket, they denied having it. The occupant eventually turned it over. The officer discovered a .380 caliber pistol in the right inside pocket of the jacket. Carr has a previous felony conviction in Niagara County Court and is legally prohibited from possessing a firearm. At the time of his arrest, the defendant was on the list of top offenders in Niagara County. 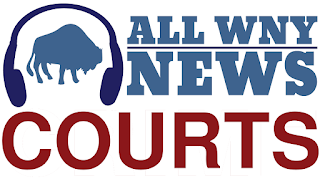 The sentencing is the result of an investigation by the Niagara County Probation Office, under the direction of Director John Cicchetti; the Niagara Falls Police Department, under the direction of Superintendent Bryan DalPorto; and the Bureau of Alcohol, Tobacco. Firearms, and Explosives, under the direction of Special Agent-in-Charge Ashan Benedict, New York Field Division.